The current MLS Cup champions will want to add another win to their season when they welcome FC Dallas to BMO Field tonight. Toronto FC have had a somewhat shocking start to their Major League Soccer season but made strides to rectify that last weekend with their home win against Orlando City SC. The Canadian side host FC Dallas this evening as the Texas-based side is looking to bounce back after giving away two points in their previous match. Last week's win against Orlando wasn't the easiest to watch for Toronto FC fans and their team had to dig deep to find two second half goals for their win. However, key players such as Eriq Zavaleta and Chris Mavinga are now back to full fitness which gives head coach Greg Vanney some much needed options at center back. Michael Bradley had been filling in due to injuries at that position and most TFC fans will be happy to see him back in midfield after some auspicious defending from their captain in previous matches. Toronto will also be hoping to have the services of Nicolas Hasler, Justin Morrow and Nick Hagglund which will again strengthen what had been a depleted backline for Toronto. At the other end of the field, Víctor Vázquez came back from his injury to strengthen Toronto's attack and helped them get their win against Orlando. With Jozy Altidore still out, Vázquez will be the chief supporting player to Sebastian Giovinco and Toronto will need their key players to be in-sync once again against a very good FC Dallas side. In their previous match against Vancouver Whitecaps FC, FC Dallas were well on top and had the goals to prove their dominance. Unfortunately, they got complacent and ended up conceding two goals in the second half that consigned them to a home draw. Head coach Oscar Pareja felt that was a learning moment for his team and will have drilled that into them all week long in training. FC Dallas usually have a strong backline but as they showed against Vancouver, they are prone to lapses of concentration from time to time. Against the likes of Giovinco, that cannot happen in tonight's game. What FC Dallas can count upon however, is their incredible attacking talent. Maxi Urruti and Mauro Diaz have been in fantastic form and will be the catalysts for any good thing that FC Dallas do going forward. With so many players just returning from injury for Toronto, tonight will be the perfect chance to test how match fit they really are. Diaz in particular will be looking to spring FC Dallas on the break if he is not marked carefully and if he's given the space to do so, he will most certainly add to his six assists already this season. It won't be an easy match for the home team tonight. FC Dallas travel well and are able to eek out points on the road more often that not. 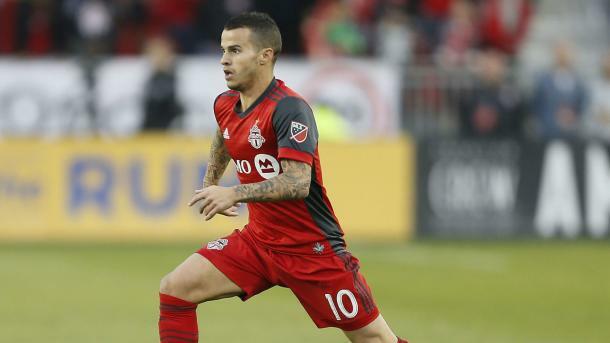 Toronto FC still have a lot of big players missing from their roster and will have to rely heavily on the likes of Giovinco and Vázquez to help them grind out a win tonight. This has all the makings of a tightly contested draw.